The Louisiana State Bar Association publishes this annual advertising supplement to assist attorneys in obtaining services they require in their day-to-day practices. The directory indexes the services three ways: alphabetically, geographically and by category. The directory is mailed with the December/January issue of the Louisiana Bar Journal. The directory is also uploaded to the LSBA's website and remains accessible for a full year. The 2019 Expert Witness, Consultant & Legal Services Directory will be current through January 2020. 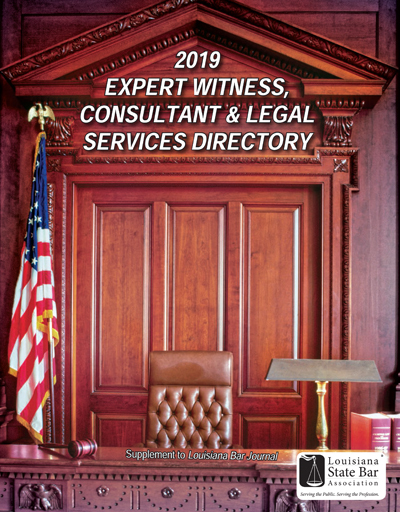 View the 2019 Expert Witness, Consultant & Legal Services Directory.